Camellia Oil USDA Certified Organic. It is crystal clear and odorless. It has been used in products for face, lips, hair and body. Evelyn Camellia seed oil has remarkable moisturizing and anti-aging properties. It's proven to be very effective in reducing fine lines, post-acne red marks and pitted acne scars, and reducing the appearance of enlarged pores. It dramatically revives skin resilience, giving your skin a radiant glow. Gentle and non-irritating, it's suitable for all skin types, especially dry/sensitive skin. It penetrates quickly and deeply, giving your skin optimum hydration without a greasy feel. Your skin will feel remarkably refreshed, smooth and firm. with the added benefits of Arette Organic Tea Seed Oil. A good place to start as an alternative to olive oil. as a flavor neutral salad dressing. Always a healthy choice for cooking and salads. with the added flavor of steamed green tea. more Vitamin E than our other oils. Contains 54.33% monounsaturated fat and 21.13 % polyunsaturated fat. 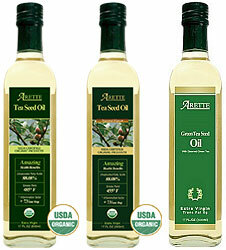 Arette flavored tea seed oils add a new dimension to the healthy kitchen. With flavors ranging from the subtle to the very spicy, you can use Arette flavored tea seed oils in salads and for your favorite recipes. a pick-me-up for salad dressings and a great addition to your favorite sauces. a flavorful dipping oil and a great addition to your favorite sauces. breads and as a dressing in crisp green salads. 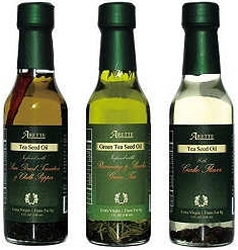 A terrific way to try all three of these uniquely flavored Arette Tea Seed Oils in your favorite recipes and save compared to ordering each individually.